Posted August 14th, 2016 by Mike Boyes & filed under Child Development, Cognitive Development: The Information-Processing Approach, General Psychology, Human Development. 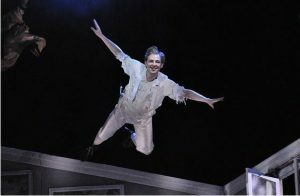 Description: The character of Peter Pan, the boy who would not grow up, the sum has been drawn upon within psychology to talk about aspects of certain disordered tendencies on the part of adult males to act in a childish, irresponsible manner. Written just after 1900 the original books about Peter Pan written by JM Barrie predated the creation of a systematic, scientific, child psychology. Despite this, Barrie, a contemporary of Charles Darwin has been described by neuroscientist Rosalind Ridley is a very keen observer infant in early childhood cognition. Before you read the article linked below can you think of anything in your recollection of the various versions of the story of Peter Pan you may have heard or seen that might in fact be viewed as comments on the nature of child cognition? Source: Pan was pioneering work of child psychology, claims new study, Alison Flood, The Guardian. In her recently published book, Peter Pan and the Mind of JM Barrie, neuroscientist Rosalind Ridley points out a number of places in the Peter Pan stories where the author clearly demonstrates an awareness of the nature of infant and early child cognition that was far before it’s time. 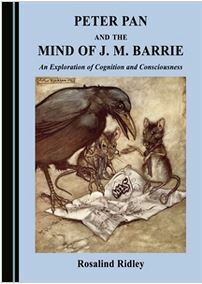 Showing pans difficulty with understanding that other people may have perspectives or points of view that were different than his own JM Barrie seems to clearly indicated that he had observed the same kind of behaviours in young children that today are central to our understanding of their developing theories of mind. Similar observations involve Peter Pan’s difficult to understand how games like hide and seek work or how strong emotional connections like love function. It is important to remember that as advanced as psychological science is today people have been in fact keenly observing the nature of children in child development as far back as one would care to look. The interesting ways in which the minds and thinking of young children can be seen to be specially different than those of their parents and other adults have drawn many people into observation and perhaps even systematic study of the developmental pathways within children’s cognition. What advantage (in terms of developmental observation) did JM Barrie the author of Peter Pan have in having created in the form of Peter Pan who in many ways did not grow up? Can you think of other individuals or social situations in which the behaviours of children are carefully observed in ways that don’t necessarily lead to scientific research but which nevertheless reveals some of the more interesting aspects of children’s thought processes? How might the early writings of Charles Darwin have influenced the work of JM Barrie in the production of Peter Pan and how might this be similar to the influence that Darwin also had another well-known person in the form of Sigmund Freud? Barrie, James Matthew. Peter Pan in Kensington Gardens/Peter and Wendy. OUP Oxford, 2008. Taylor, Ian Frued: The Darwin of the Human Psyche, http://www.creationmoments.com/content/freud-darwin-human-psyche. Accessed August 14, 2016.